James, the son of Zebedee, was one of the twelve apostles of Jesus. His is the only martyrdom to be recorded in the New Testament, and therefore it’s held that he was the first of the apostles to be martyred. The book of Acts describes James as executed by sword by ‘Herod the King’ (aka. Herod Agrippa, who was grandson of Herod the Great). 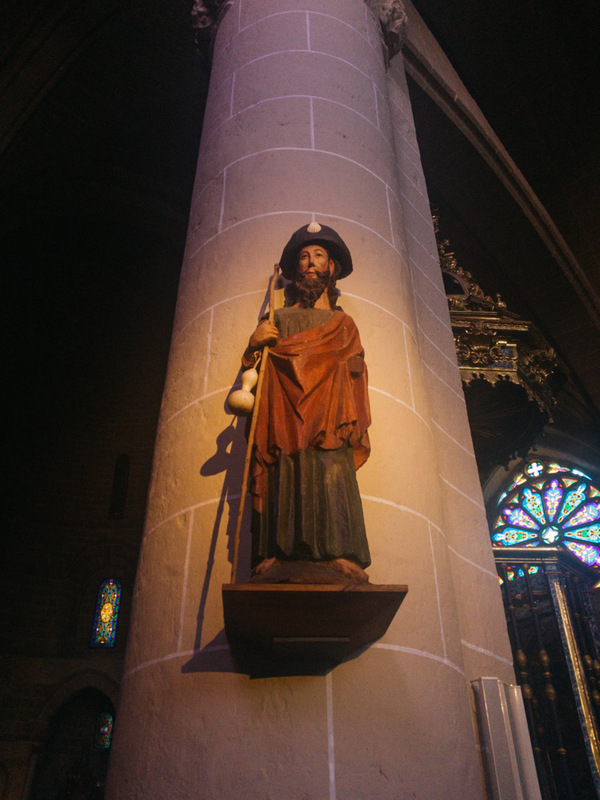 Tradition has it that Saint James’ remains were taken in a boat from Jerusalem to Galicia, in northwestern Spain, and his remains are buried beneath the Catedral de Santiago de Compostela. 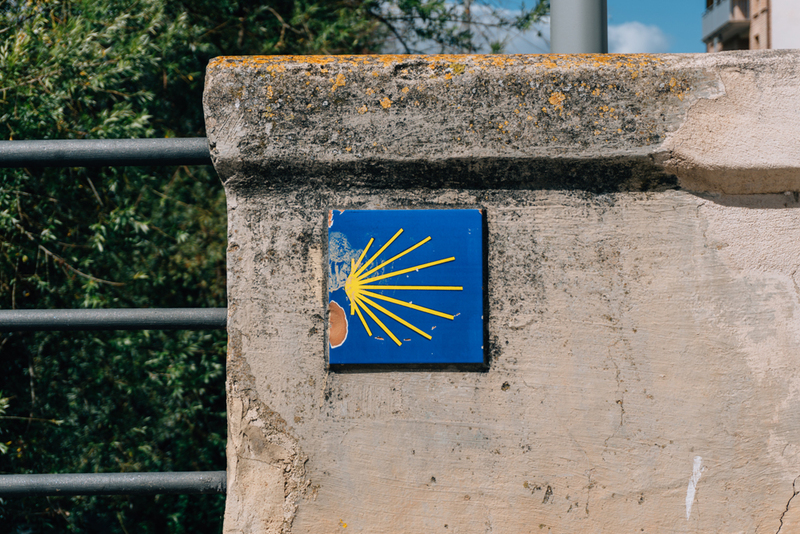 Along with Rome and Jerusalem, the Camino de Santiago (the Way of Saint James) was one of the most important pilgrimages for Christians to make in the Middle Ages. As with other pilgrimages, taking this journey would earn pilgrims their plenary indulgence – a reduction in the amount of punishment you would have to undergo for your sins. As with most pilgrimages, the pilgrims of the Camino would traditionally set off from their own home, and their journey would end at Santiago de Compostela. However, even in the middle ages, several routes were popularized. The earliest records of pilgrims arriving to Compostela were in the 9th century, and the earliest records showing pilgrims starting in the Pyrenees ie. the Camino de Frances (the French Way) was in the 11th century. Today, the route beginning at Saint Jean Pied de Port, on the French side of the Basque Pyrennes, is by far the most popular. By the 12th century, the pilgrimage was highly organised. This was mostly due to the Codex Calixtinus which was published around 1140 by Pope Callixtus II - a great proponent of the pilgrimage. Even today, the 5th book of the Codex is a definitive source for many guidebooks. This text launched what is now known as the Compostelan Holy Years. To service the needs of the pilgrims, a series of hospitals sprouted up all along the trail. In the Middle Ages hospitals were like almshouses for the poor or hostels for pilgrims. Donations were encouraged but many poorer pilgrims barely had enough health to make it to the next stop, so were cared for by these religious institutions. Many towns still tell this story in their names, such as Hospital de Orbigo. The scallop shell has long been the symbol for the Camino. As the symbol for Saint James, and often found on the shores of Galicia, it became customary early on for pilgrims to carry back with them a Galician scallop shell as proof of their completed journey. As the medieval pilgrimage became established, many pilgrims began to carry a scallop shell to identify themselves as a pilgrim. This gave them privileges to sleep in churches, ask for free meals, hopefully ward off thieves, and even function as a drinking or eating vessel. The scallop shell is also a metaphor – the grooves in the shell coming together at a single point represents the idea that all roads lead to Santiago. The scallop shell motif on signposts at regular intervals is the symbol that guides pilgrims along the way. The Protestant Reformation, the Black Death and European economic decline meant that pilgrim numbers decline dramatically over the coming centuries. Up to the 1980s, only a few pilgrims would arrive in Santiago each year. But there has been a momentous renaissance for the Camino since it became a UNESCO World Heritage Site and named a European Cultural Route in 1987. So much so that in 2016, 276,224 pilgrims arrived in Santiago and achieved the minimum 100km to receive their Compostela certification (46% were Spaniards), and the numbers are still increasing every year. Older PostNew Zealand in winter: when you already know it’s going to be beautiful and dealing with disappointment… (a confession).